Bo Luc Lac, directly translated to English as Shaking Beef, got its name because of the shaking action involved while cooking it in a Wok. Once you put the beef into the Wok and let it sear for about a minute on one side, you begin shaking it so it can sear and cook on the other side. This shaking process continues until the beef is seared on all sides and cooked to medium on the inside. 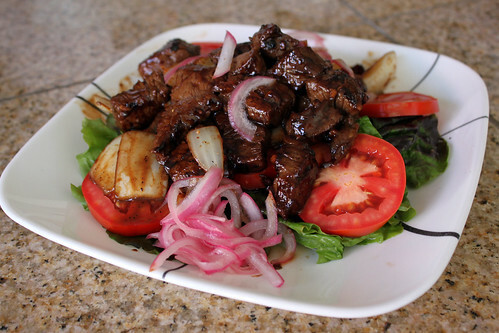 There are many variations of Bo Luc Lac out there and this dish is prepared differently everywhere I tried it. Quite frankly, you can basically make this recipe with whatever ingredients you have in your pantry. For my dish, I used Beef tenderloin. Beef tenderloin but you can use whatever beef you have available. This dish is, easy, tasty, and definitely a crowd pleaser. 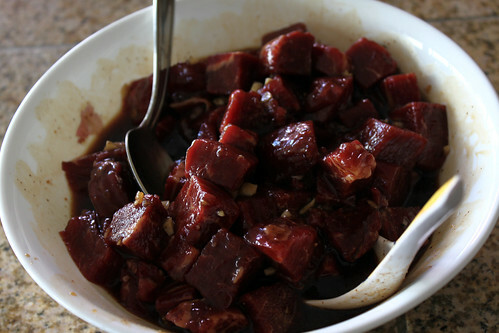 Cut beef tenderloin into bite sized cubes or about 1-inch cubes and put it in a bowl. In another bowl, whisk oyster sauce, soy sauce, Maggi Seasoning, fish sauce, sesame oil, cracked black pepper and sugar until sugars are dissolved and sauce is mixed together. Add minced garlic. Add 3 tablespoon (or as much as you need) of sauce to the beef until beef cubes are evenly coated. Let marinate for about 1/2 hour. While beef is marinating, you can make the dressing. In a small bowl, whisk 1/4 cup rice vinegar, 1/4 cup distilled vinegar, sugar, salt and crushed black pepper until sugars are dissolved. (I didn’t do it this time, but I think next time I will add some Vegetable oil since salad dressings always have some kind of oil in it. If you don’t want to add oil, it should be okay since it still tastes pretty good.) 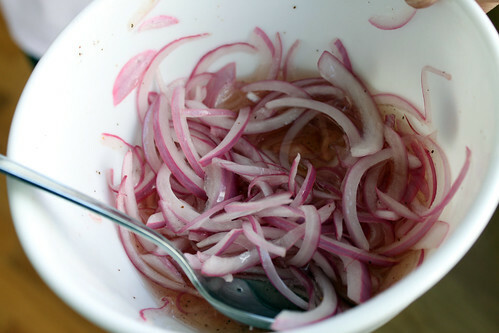 Thinly slice half a red onion and add it to the dressing and let sit until after the beef is cooked. Also, while the beef is marinating, you can plate the dish with a bed of red lettuce and sliced tomato on top of the bed of red lettuce. 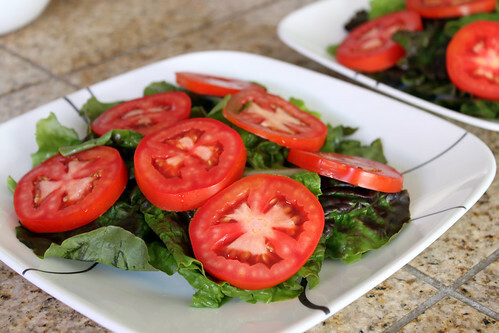 If you don’t have red lettuce, you can put your favorite salad on the plate. Turn heat on HIGH until wok or frying pan is super hot to the point where it gets a little smokey. Add 1 tablespoon oil to the pan and add half of the beef to the pan and have it spaced out. Let the beef sear for about a minute, then hold the handle of the wok and shake it so it can begin searing the other side for about 30 seconds and add half the yellow onions and shake it a couple more times. The total cooking time should be about 4 minutes. 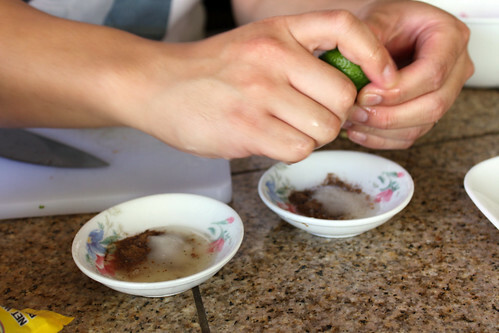 Pour the first batch over the bed of lettuce and begin cooking the second batch by repeating Step 6. 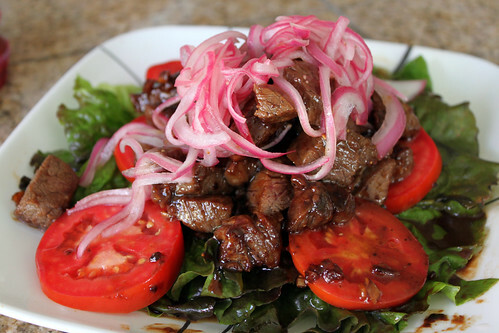 Once all the beef is plated, put the red onions from the dressing on top of the beef and drizzle the dressing on top of the Bo Luc Lac. Serve with rice or you can eat it as a beef salad. I served the Bo Luc Lac with red rice. 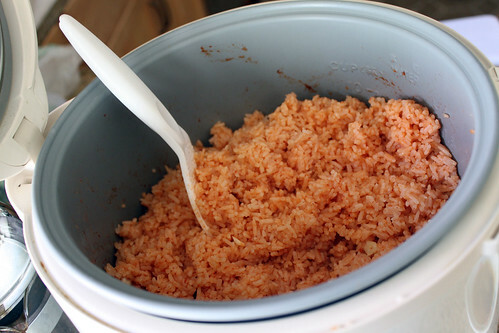 I made a quick red rice with the rice cooker. I added 3-4 tablespoon of tomato paste, 4 crushed garlic, some salt and pepper to 4 cups of rice in the rice cooker and let it cook. After it is done cooking, I added 3 tablespoon of butter and fluffed up the rice with a fork. I also made a quick salt, pepper, and lime sauce in case anyone wanted to dip their beef to it.